A powder sample of hardened concrete is obtained by drilling or grinding the cover concrete in the structure, or a sample is obtained from the fresh concrete. The sample is mixed with a specific amount of extraction liquid and shaken for five minutes. 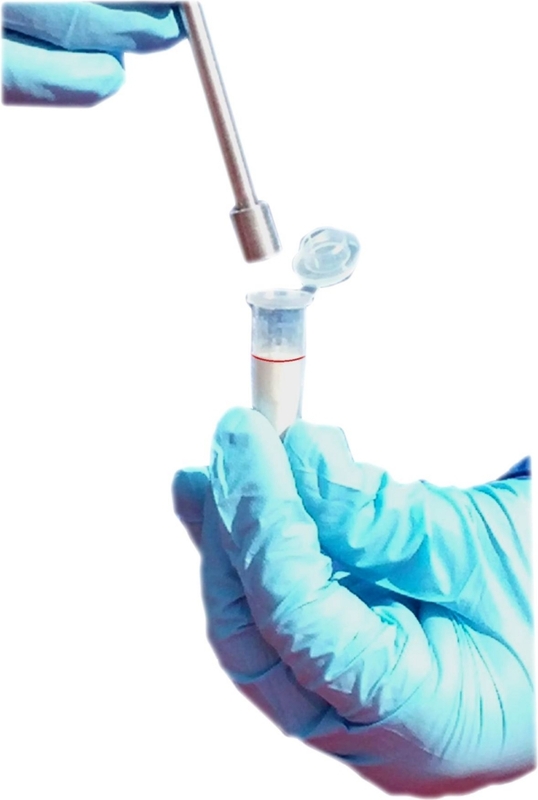 The extraction liquid is designed to remove disturbing ions, such as sulfide ions, and extracts the chloride ions in the sample. 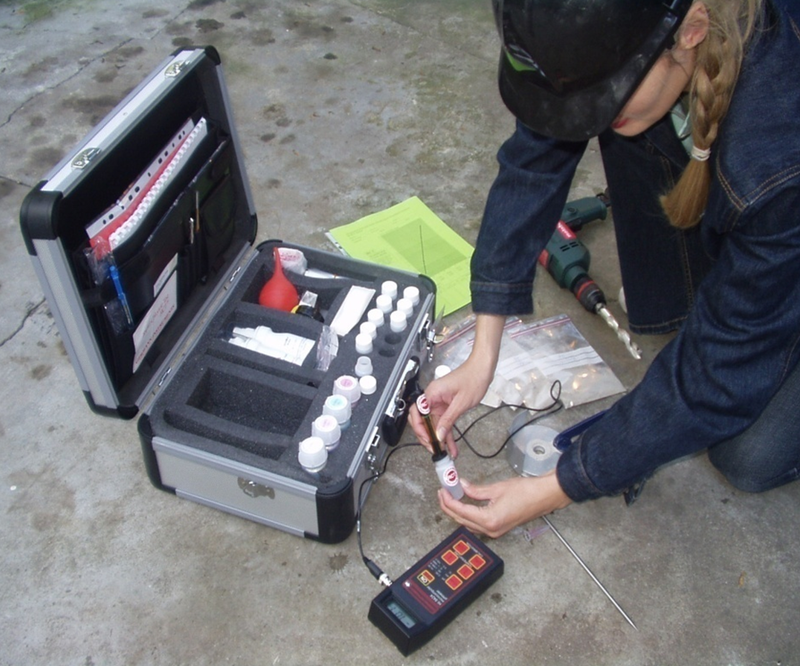 A calibrated electrode is submerged into the solution to determine the amount of chloride ion, which is expressed as percentage of concrete mass. The two methods use different kinds of extraction liquids. The type of method to use will depend on the specification criteria for maximum allowable chloride ion content in either hardened or fresh concrete. Note that the acid extraction does not remove chemically bound chlorides. 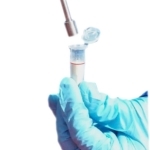 Numerous correlations have been made between RCT test results and chloride ion content determined by standard laboratory potentiometric titration methods such as AASHTO T 260, ASTM C114, DS 423.28 or NS 3671. The following graph shows the results of such correlations made by various laboratories in the Scandinavian countries and in the U.S. 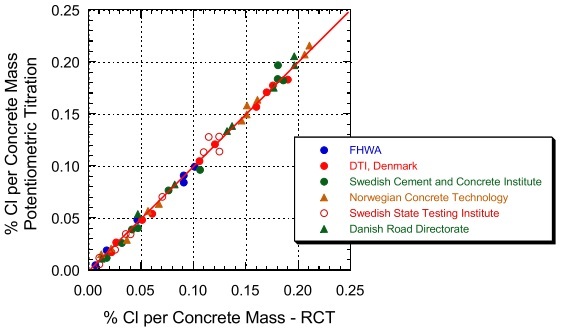 In one comparison, the Swedish National Testing Institute produced concrete powders containing known amounts of chloride ion introduced into the concrete by diffusion. The concretes were made with different binders as illustrated in the table below. Parallel testing was done in accordance with, AASHTO T 260 and with the RCT system. The RCT readings were taken after the powder samples were kept in the extraction liquid overnight to obtain full extraction of acid-soluble chlorides. 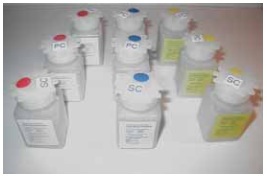 Alternatively, if the result is obtained after 5 minutes of shaking of the vial, a correction factor can be applied to the measured chloride ion content. The following table compares the known chloride ion content with the values determined by the RCT and by AASHTO T 260. The accuracy of the RCT results compared with the known amount of chlorides is as good as with the AASHTO T 260 potentiometric titration method. The average deviation of the RCT results from the known amount of chlorides is within ± 4 %. For repeated testing with the RCT on the same concrete powder, the coefficient of variation of test results is on average 5 %. 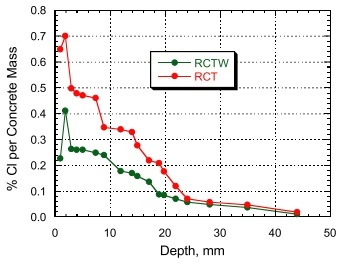 The precision and accuracy of the RCTW test for water-soluble chlorides is similar to RCT results. An example of a chloride ion profile measured with the RCT is illustrated. The graph to the right shows two other profiles that were obtained from on-site profile grinding on a highway bridge column exposed to deicing salts for 4 years. 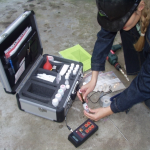 Concrete powder samples were obtained at depth increments of 1 to 2 mm and were analyzed for acid -soluble chlorides with the RCT and for water-soluble chlorides with the RCTW. The depth of carbonation was measured to be 2 mm using the Rainbow Indicator, corresponding to the initial peaks of the chloride ion profiles obtained. 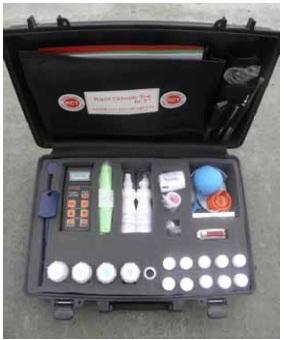 The manual included in the RCT-500 kit covers testing for acid and water-soluble chlorides in hardened as well as in fresh concrete. 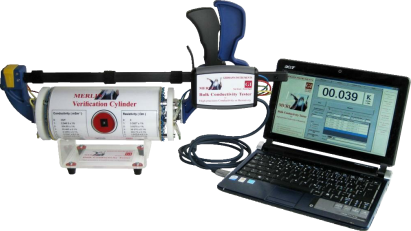 Separately delivered is a binder (RCT-1100) with 15 years of testing experience, including an advanced theory for chloride diffusion modeling. 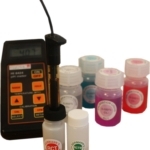 It is recommended to always have an extra set of clean RCT-1030 calibration liquids to ensure that the chloride electrode is working properly should deviations occur from the usual obtained calibration curve. 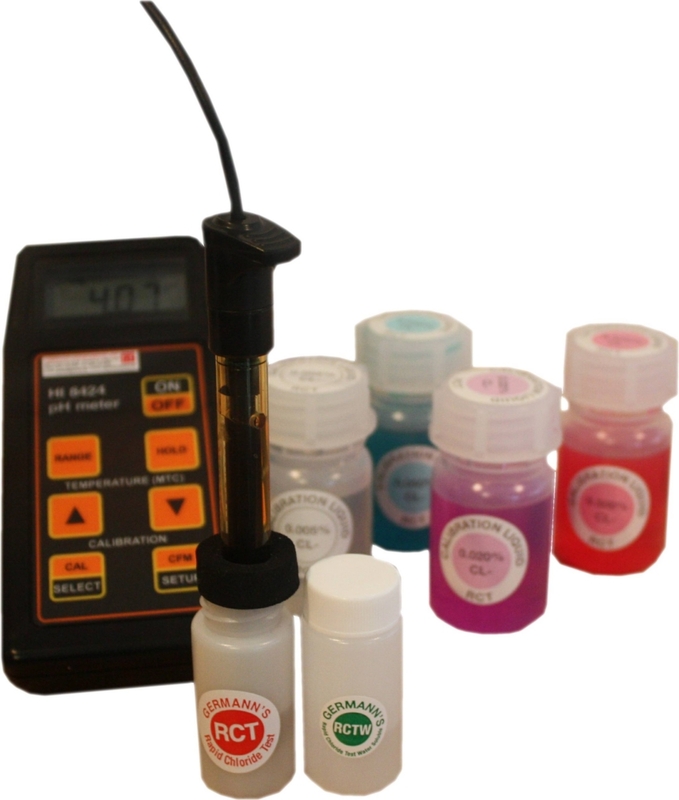 The RCT-1000-1 EWA (electrode wetting agent) contains 300 mL of liquid for refilling the RCT-1000 EWA bottle, which has a spout that fits into the electrode hole. The RCT-1032 mixing container and cup is for testing samples of fresh concrete.